FRAMINGHAM – The City of Framingham Charter calls for employment vacancies to be posted for a “minimum of 14 days” either publicly or internally. The City of Framingham may not have posted the Framingham Police Chief position as required by the Charter, before Mayor Yvonne Spicer announced her appointment of Steven Trask as the City’s new chief last Tuesday. “No posting was placed in any area of the Police Department and no electronic communications listing the position were sent that the FPSOA is aware of,” said Framingham Police Superior Officers Association President Scott Brown. On September 25, Mayor Spicer announced she had appointed Trask the City’s police chief, pending approval of the 11-member City Council. The Council has 30 days to approve or reject the appointment. A 2/3rd vote is needed. Trask was appointed Acting Police Chief in April following the retirement of Ken Ferguson. An acting chief can only serve a maximum of 180-days. Trask term as acting ends October 28, 2018. Framingham Source emailed the Mayor’s Office and the City of Framingham’s Human Resources Department on Friday at 9 a.m. asking specifically when the police chief position was posted, for how long, and where. UPDATED: City of Framingham Dolores Hamilton emailed Source this evening to say the police chief position was posted internally on Tuesday, September 25. “The position was posted internally as of 9/25/2018 and will come down on 10/9/2018,” wrote Hamilton in an email today, October 1. “I am told, but it has not been confirmed, that the job was posted a day or a few days prior to the Mayor’s announcement of her selection. As such the 14-day period required by the charter had not expired prior to the Mayor’s announcement.,” said City Council Chair Dennis Giombetti. “I think it is safe to say the intent of the Charter, the general standard and HR common practice is to post the job opening for the required 14 days prior to announcing the selection. Posting it after you make your final decision or having it still open seems to defeat the purpose of posting the job opening and is not good HR practice. I expect the Council to query the Administration on this issue,” said Giombetti to Source. This is not the first time the Human Resources Department has failed to post a position for the minimum of 14 days, and not the first time the Mayor has made an appointment this year with out a position posted for 14 days. 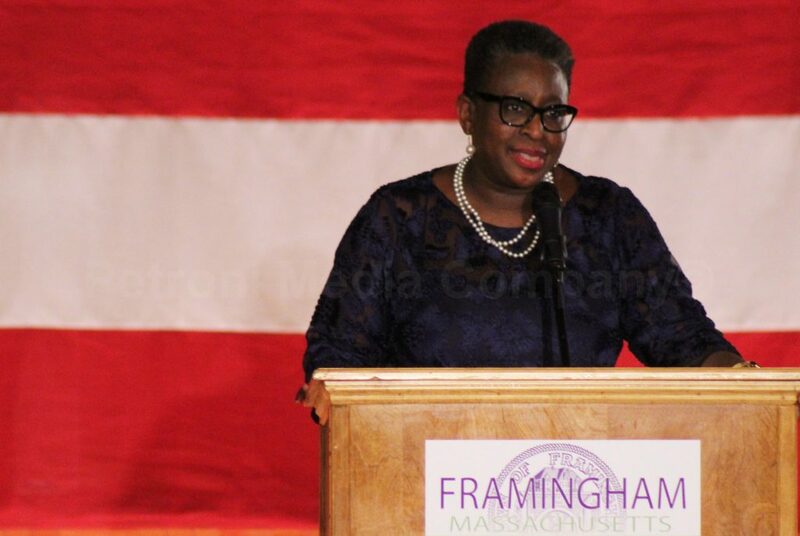 Earlier this year, Mayor Spicer had to withdraw her selection to the Framingham City Council for Veterans Services Officer and re-post the position for 14 days. Spicer later submitted the same name, after the position was posted. “The Veteran’s Agent position wasn’t posted at all; now we’re being told that the Police Chief’s job wasn’t properly advertised. This isn’t a gray area in the Charter; it’s an incredibly easy, but very important process. If it’s true, once again a lot of people have been put into an unnecessarily difficult and awkward position,” said City Council Appointments Subcommittee Chair Cheryl Tully Stoll. The Framingham City Council meets Tuesday night. The Council has the option to refer the Mayor’s choice for Police Chief to the appointment subcommittee, to approve the position, or to reject the position for procedural reasons, due to the 14-day posting. “It was with great concern and surprise that we learned Mayor Spicer has nominated Steven Trask to serve as the next Chief of Police for the City,” wrote both Framingham Police Unions in a joint statement released on Thursday. “The lack of any process to identify departmental priorities, community concerns or the best candidate to serve as Framingham’s leading law enforcement officer is a disservice not only to the men and women who serve this City, but to the citizens themselves. It has been a very public matter that the department has been through some of its most trying times recently, and making no effort to identify new leadership that could change the climate is perplexing. The Mayor states that she wants transparency, inclusiveness and diversity in our city, yet nothing about this appointment reflects any of those edicts.This appointment was done behind closed doors, with no input from members of the department or public,” wrote the Framingham Police Patrol Officers Union and the Framingham Police Superior Officers Association in a statement. The Mayor responded to that statement with one of her own. “It is with that confidence in the department that I chose to promote from within an individual with the experience and credentials be its leader,” wrote Mayor Spicer in a statement released to the City Council on Friday. Mayor Spicer did not address the hiring process for police chief in her statement. Over the weekend, the leadership of the two Framingham Police Unions released another statement. “Both organizations, with the interest of the public and the officers serving them in mind, maintain that without a transparent and open selection process, simply appointing the acting chief only serves the interest of a few rather than that of the public and the men and women a new Chief intends to lead, protect and serve,” wrote the union leadership. “Our Charter requires transparency and encourages best practices in filing municipal positions. Mayor Spicer’s failure to conduct a fulsome, open, and participatory community process does a great disservice to Chief Trask, the men and women of the department, and the people of Framingham,” said former Mayoral candidate and former Framingham Charter Commissioner John Stefanini. When Framingham hired a new Superintendent of Schools, the public was invited to focus groups to discuss the needs of the district. Priorities were identified. A Search Committee comprised of district employees, parents, and community members was formed. Finalists were identified and public interviews were conducted. There is no specific process for hiring a police chief in Framingham, but the final decision is left to the elected Mayor. The enforcement of the City of Framingham Charter falls to the Mayor, according to the legal document. “It shall be the duty of the mayor to see that the provisions of the charter are faithfully followed and that all municipal agencies and municipal employees are in compliance with its provisions,” states the Charter on page 56. “Whenever it appears to the mayor that any municipal agency or municipal employee is failing to follow any provision of this charter, the mayor shall, in writing, cause notice to be given to that agency or employee directing compliance with the charter. If it shall appear to the council that the mayor personally is not following the provisions of the charter, it shall, by resolution, direct the attention of the mayor to those areas in which it believes that there is a failure to comply with charter provisions. The procedures made available in General Laws chapter 231A may be used to determine the rights, duties, status or other legal relations arising under this charter, including any question of construction or validity which may be involved in such determination,” states the Charter in Article 9, Section 14.